Samsung Galaxy S8 is one of the most good-looking smartphone of 2017. Galaxy S8 is the first smartphone to be introduced with an almost bezel-less screen. The overall appearance of S8 is iconic. Samsung has worked a lot on its software as well. They have introduced some new features like the iris scanner and Bixby. The developers of Samsung have also worked really hard on tweaking the Camera app as now it gives great quality pictures. The battery life of S8 is optimal for daily use, it gives you a full day without any issues. The display screen of S8 is just amazing, it offers the sharpest and clearest screen among all the other smartphones. Well, in this guide we will particularly talk about software issues and how to install stock firmware on Galaxy S8. Talking about the hardware. The American and Chinese versions of S8 are running on Snapdragon 835, whereas the international version is running on Samsung’s very own Exynos 8895 Octa-core. There is also 4 GB of RAM to assist the processing. Why do you need to Install Stock Firmware on Galaxy S8? There can be a number of answers for this question, if you want to unroot your phone and go back to stock firmware from some custom ROM then you will have to flash stock firmware on your Galaxy S8. There are some issues which are not going away by clearing cache or even by a factory reset. If your phone is not behaving in an orthodox manner you are having random boots. This guide can also be used in order to move back to stock recovery. The option that is left with you is to install stock firmware on Galaxy S8 or S8+ is either by ODIN or smart switch. It makes it clear if the issue you are having on your S8 is because of firmware/software or is it a hardware issue, so you need to take it to some repair shop to get it fixed. If it is a software issue then flashing stock firmware will completely solve it once and for all. 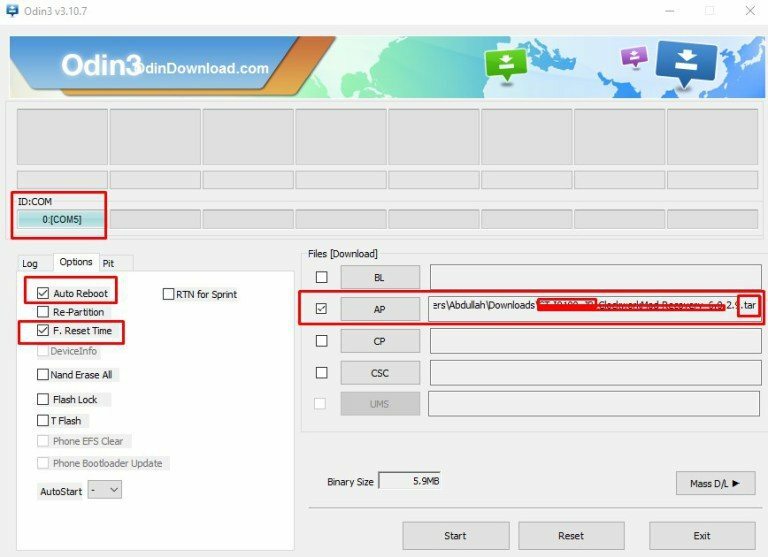 ODIN is the official tool by Samsung and most commonly used software for installing firmware on Samsung smartphones and it works fine. If you are not that good with technology you should move on to the second method that uses the smart switch to install stock firmware on S8. Although you can also try out the following method, it is not that complex and I will explain it down in simple words for you guys so it is comprehensible for the non-tech people as well. So, moving on to the guide. First, you need to consider some pre-requites and you will have to download some files on your laptop or PC. Mind you, ODIN does not work on MACs or computers running OSX operating system. If you have MAC jump to the second procedure. Note: If you are using Galaxy S8 on Verizon then you can use this guide to install stock firmware on it. Your phone should be charged>40%. Go to Settings -> About Device -> Tap on Build number 7 times. Now Go back to Settings -> Developer Options -> Turn on USB debugging. First of all, download and install Samsung USB drivers on your Windows PC. These drivers are already on your Windows PC if you have been using data cable to connect your phone to PC or you have smart switch. These drivers are required for your PC to recognize your phone over a data cable connection. Furthermore, download the official stock firmware for Samsung Galaxy S8. Make sure you select the right model of your phone. If you don’t have any idea about your phone CSC and build number then go to About phone in settings and see the details there. If your phone is stuck in a boot loop then download the firmware with respect to your carrier and country. Make sure that you don’t install an unbranded firmware on a branded phone. If your phone is carrier free and it is not branded then, you can install any unbranded firmware of any country. Although it is recommended to get the exact match of your phone’s already existing firmware, in this way you will not lose any data present in your phone. Branded phones are the ones which show a logo of any carrier company at startup (e.g. Verizon, T-Mobile, Telenor, Docomo). Once you have downloaded the stock firmware with respect to your phone then proceed forward. Now moving on the guide, just follow the steps below as it is. These are pretty simple. Even if it is your first time you don’t need to worry. If you have confusions or questions regarding any step mentioned in this guide, you can ask me in the comments. First of all, install Samsung USB drivers on your PC or laptop. Now you have to install ODIN on your Laptop. Now turn off your Galaxy S8 or S8+. Once your phone is completely shut down. Press and hold the Bixby and Volume down buttons, then press the Power button. When you see a warning release the button and press Volume up button to continue. Now on your PC open ODIN. Connect your phone to your PC using the USB cable. ( Make sure you are using original data cable). Once your phone is connected you will notice on ODIN that the ID:COM will change its color to blue. ( If the color didn’t change, then the PC has failed to recognize your phone. Make sure you have installed the right drivers and the drivers were installed successfully. Sometimes the fault lies in the USB cable). After your phone is connected. Click on PDA or on some Odin versions it is AP. Now select the .tar or .tar.md5 file from the files in extracted firmware. Make sure only Auto Reboot and F.Reset Time are checked in the options tab of Odin. Now if everything is ready. Press on Start. It will take around 10 minutes to install stock firmware on Galaxy S8. If the flashing is unsuccessful due to some reason. Then try with some other version of Odin. Finally, if the flashing is successful. Your phone will reboot and it will have the official stock firmware of Samsung. If the firmware that you downloaded and extracted has more than one file then select the corresponding file in its specific tab in Odin. Identify the files from their extension type. typeBL belongs to Bootloader, AP belongs to PDA, select CP in Phone(Modem) tab and select CSC file in CSC tab. The new smartphones of Samsung support Smartswitch, it is a great software in order to backup all your data to your pc or you can also use it to install official firmware on your Galaxy smartphones. Only a few latest ones like Note 8, Galaxy S7 and S8. Download Smart Switch from its official website and install it on your PC. It works on Windows PC as well as MAC. Once Installed. Open it and connect your S8 to your PC using a data cable. The smart switch will recognize your phone. Now you will have an option to install stock firmware on your phone using Emergency Software Recovery and Initialisation. Now select Software update and Initialisation. The smart switch will itself find the latest suitable firmware for your Galaxy S8 and install in on your phone, just follow the on-screen instructions. Once installed your phone will reboot. Know that you will lose all your data present on your phone using this method. You can also backup all your data using smartswitch on your Windows PC. Once you are done with installing the firmware on your S8, you can use this software to restore all your data back to your phone. That is all from my side. I hope this guide helped you and you were able to install stock firmware on Galaxy S8. Know that this guide can also be used to unroot your Galaxy phone or fix it if it is stuck at startup in a bootloop. All the software issues can be dealt with in this guide. If you have any queries or questions, feel free to ask me in the comments or reach back to us using contact us button or social networks.